Let’s be honest—there really is no taste to water, and the overwhelming desire to drink it, for some people, might not come along unless they are dying of thirst. But water plays such an essential role in our lives! Our bodies are made up of about 70% water, so it is imperative that we drink enough. If the taste of plain water doesn’t appeal to you, then why not try flavored water? Flavored water is nothing more than regular water with added ingredients. For people who like to tantalize their taste buds with a touch of sweetness or tanginess, flavored water can be the perfect, refreshing alternative. It has all of the same nutrients as regular water; in fact, if it is homemade, it can contain even more nutritional value. Because of the high percentage of water in our bodies, we already know that water plays an essential role in helping our bodies function properly. This is why it is recommended that you consume at least six 8-oz. glasses of water each day to get its full benefits. If you’re not a fan of regular H2O, or if you don’t consume enough water each day because the taste is too “bland,” then flavored water is the perfect solution for you. You can also add more nutrients to your homemade flavored water, depending on the type of flavor you are creating. Since plain water is already good for you, then why not stack it with more vitamins and minerals that many fruits and spices offer? Adding different herbs, fruits, and even natural, herbal teas to your water can help boost its nutritional value as well as eliminate the bland taste. Of course, the primary difference between flavored water and plain water is the taste—but you have to look at the nutritional value as well. Homemade flavored water usually incorporates natural nutrients. There is some concern with the flavored water that you find in grocery stores, sometimes called “carbonated water.” For instance, researchers have found that drinking artificially carbonated water actually leaches calcium from the bones in your body, which in some cases can cause kidney stones. It has also been said to strip the enamel from your teeth. The water that you use to make your flavored water should never be from a bottle; it should be filtered water from a tap. You will also need a jar to mix everything in; make sure the jar is glass, as plastic can strip the nutrients. Once you add all the ingredients into the jar, use a spoon to release some of the flavor before adding the water. The last thing you need to keep in mind is the fruit/vegetable-to-water ratio: one part fruit/vegetable for every four parts of water—you don’t want to overwhelm the drink. Even with flavored water, people often get bored with using the same old ingredients, so new recipes are always being created! For example, Suntory, a Japanese beverage company, has created the first-ever yogurt-flavored water. You can find it in many grocery stores in the U.S. and the drink actually provides more minerals and amino acids than a regular bottle of plain water does. An average serving of the Suntory beverage only contains 124 calories. Although homemade is always better, this is just an example of the new and innovative flavors you can try. Another new fan favorite is vanilla and pear-flavored water. It’s quite simple to make. Get a bit of natural vanilla extract and then slice up a few pears into small pieces. Put both in a jar, shake well for a minute, and then add cold water to it. Below are five more delectable ingredient combinations to try in your flavored water. 1. Jalapeno and watermelon: I know what you’re thinking—“Sweet and spicy water? That can’t possibly taste good!” Nevertheless, the two ingredients complement each other rather nicely. All you need is some sliced jalapenos and diced watermelon. Put it all in a jar, add cold water, and let it sit overnight. Your water will taste sweet and spicy, and will be packed with vitamins A and C.
2. Blackberries and sage: Throw some small blackberries into a jar, add a few sage leaves, add cold water, and let it sit overnight so the sage can release its flavor. Your water will taste refreshing and minty—and you’ll also get loads of fiber, polyunsaturated fats, and vitamin A. 3. Peach slices and cayenne pepper: Slice the peaches, add a dash of cayenne pepper to them, and then throw the ingredients in a jar. Add cold water and drink it right away so the pepper does not dissolve and lose its flavor. 4. Lime slices and basil: Slice up three or four limes and add to cold water. Sprinkle some basil into the water to get a nice boost of vitamin C and iron. 5. Raspberry and pineapple ice cubes: This is a fun way to spice up your water. Instead of freezing ice cubes, fill the ice cube tray with raspberries and small pieces of pineapple. Freeze overnight and then add the frozen fruit cubes to regular water. Of course, these are just a few flavored water recipe ideas. You can create just about any kind of flavored water you want! Discover what nutrients you lack in your diet and you can easily incorporate them into your water by using delicious and healthy fruits and vegetables. Drink up! 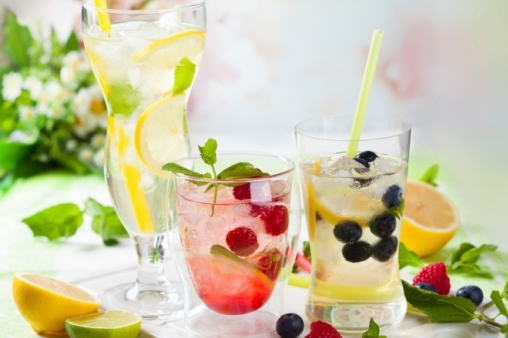 “How to Easily Make Your Own Flavored Water for Detox and Weight Loss,” Health Junket web site, April 2, 2015; http://www.healthjunket.com/how-to-easily-make-your-own-flavored-water-for-detox-and-weight-loss.html. Baseel, C., “Yogurt-flavored water?!? We try Suntory’s new beverage straight, mix it with booze (Taste Test),” RocketNews24 web site, April 15, 2015; http://en.rocketnews24.com/2015/04/15/yogurt-flavored-water-we-try-suntorys-new-beverage-straight-mix-it-with-booze-%E3%80%90taste-test%E3%80%91/. Blumberg, P.O., “10 Natural Flavored Water Recipes,” Reader’s Digest web site; http://www.rd.com/slideshows/flavored-water-recipes/#slideshow=slide1, last accessed May 6, 2015.